Most owners start a business with a view to making a profit to give them a return on their investment. This return can be measured using the return on equity ratio, calculated by dividing the net income by the owners equity. In itself, the ratio does not explain which aspects of the business are impacting on its ability to make a return. To do this the DuPont analysis is used to separate the return on equity into five separate ratios. Tax effect ratio – How the business is impacted by the taxation system. 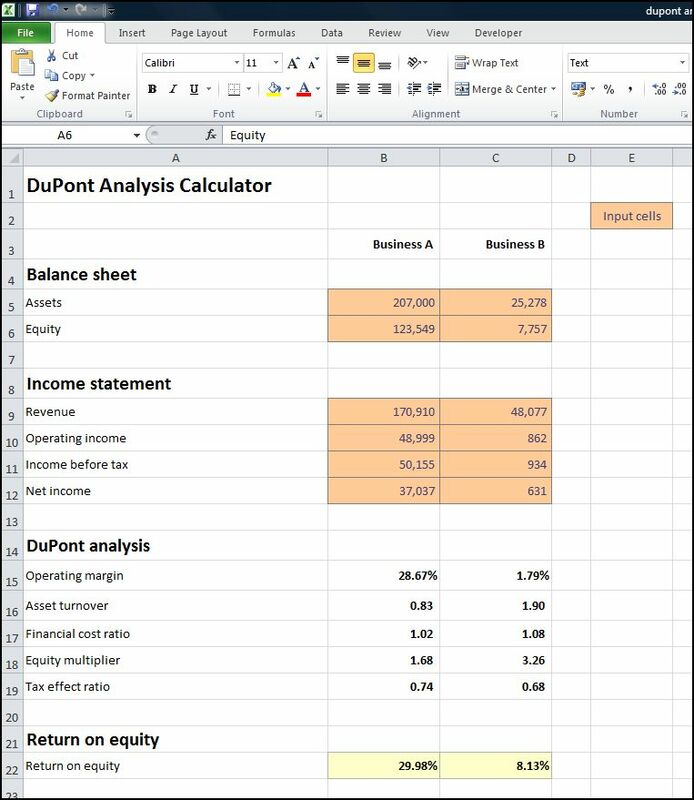 This DuPont analysis calculator allows a business to input details of assets and equity from the balance sheet, and revenue, operating income, income before tax, and net income from the income statement, and calculates the five ratios and the return on equity. The calculator allows details of two businesses to be entered so that comparisons can be made. Enter the assets Assets are obtained from the balance sheet of the business. The amount to enter is the total value of both current assets and long term (fixed) assets. Enter the equity Equity is also found on the balance sheet of the business. The amount is the total of capital invested by the owner and retained earnings. Equity is sometimes referred to as shareholder equity. Enter the revenue Revenue is found at the top of the income statement, and is sometimes referred to as sales or turnover.. Enter the operating income Operating income is found on the income statement and might be referred to as earnings or profit before interest and tax (EBIT or PBIT). Enter the income before tax Income before tax is found on the income statement and is sometimes called earnings or profit before tax (EBT or PBT). Enter the net income Net income is found at the bottom of the income statement and is often referred to as earnings or profit after tax (PAT). For each business entered, the DuPont analysis calculator works out the value of each of the five ratios and the return on equity. The DuPont analysis spreadsheet is available for download in Excel format by following the link below. Users use this business Dupont analysis calculator at their own risk. We make no warranty or representation as to its accuracy and we are covered by the terms of our legal disclaimer, which you are deemed to have read. This is an example of a roe calculator template that you might use. It is purely illustrative of a return on equity calculator. This is not intended to reflect general standards or targets for any particular company or sector. If you do spot a mistake in the Dupont formula calculator, please let us know and we will try to fix it.